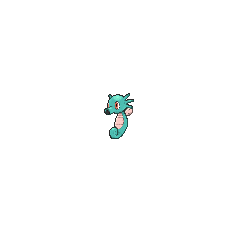 Horsea in game: 2,554 Who? Important notice! Pokemon Horsea is a fictional character of humans. It is highly adept in the water, using its dorsal fin to swim in any direction while facing forward. It can use its tail as both a balance and an anchor when caught in a strong current. In safer environments, it uses its tail to play with other members of its species. 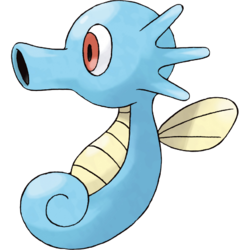 If Horsea senses danger, it sprays water or dense black ink from its mouth at its attacker. It can shoot ink more precisely at insects flying above the surface of the water. Horsea feeds on insects and moss gathered from rocks. It nests in coral reefs and islands throughout the ocean. Many Eggs are laid every year, and the young are raised by the male Horsea rather than the female. Misty captured a Horsea in Tentacool and Tentacruel. 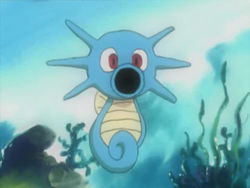 Horsea also appeared in the banned episode EP035. Multiple Horsea were among the Pokémon seen at Professor Oak's Laboratory in Showdown at the Po-ké Corral. Multiple Horsea also appeared in The Power of One. A Horsea appeared in Mantine Overboard! living underwater. A Horsea was seen at a Pokémon Center in The Legend of Thunder!. Two Horsea appeared in Going for the Gold!. Green had a Horsea in Zap! Zap! Zapdos! on her team that she received from Silver in exchange for her Snubbull following their escape from the Masked Man, using her in her crafty tricks such as cloaking areas with Smokescreen or leaving ink trails. She was later transferred back to Silver, and eventually evolved into Kingdra. 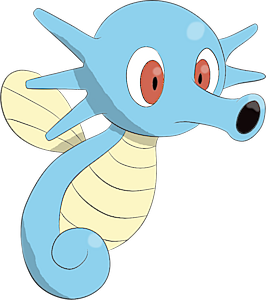 Horsea appeared in ''Breath of the Dragonair Part 1 where it was used by a trainer in a surfing contest, before it was interrupted by Lance controlling the winning prize, a Dragonair. Lance's Horsea was seen in a flashback of his and Clair's childhood. 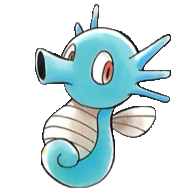 In its original artwork, Horsea had a pair of fins instead of just one.